Good morning! 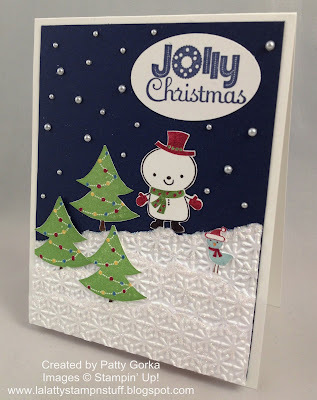 This week's 52 Christmas Card Throwdown blog challenge is an embellishment challenge and we are using pearls! I couldn't get this idea of using pearls as snowflakes out of my head and so I decided to run with it. I think it looks neat with the different size pearls for the snowflakes. I started creating my card by cutting a night of navy background to size (4" x 5 1/4"). Then I took some white card stock and tore it for the snow. Here's a tip- when I was cutting the width of the white card stock I left it a hair wider than 4" because when you run it through your big shot to emboss it the card stock will shrink. Using a 2 way glue pen I added some dazzling diamonds glitter along the edge and all over the embossed snow. I have 3 layers of white card stock for the snow and the top 2 layers have dimensionals underneath them. Here's a close up photo of the snowy area part of my card. I wanted to show you how I have the top 2 layers of snow raised up using dimensionals. It looks really neat with the trees placed between each layer. The trees were stamped using gumball green ink and then using SU markers I colored the lights and tree trunk and I cut them out. When I placed the trees on my card in the snowy area I used glue where the trees would be sitting on the embossed card stock (it won't hold very well on the embossed area if you don't use glue). There are dimensionals under the top part of the tree. The tree on the night of navy card stock is simply glued on. For the snowman I colored my stamp using SU markers, cut him out and placed him on my card. I did the same thing with the little birdie except since he's sitting on the snowy area I had to use glue to adhere him. My sentiment was just stamped and punched out using my extra large oval punch. And lastly, I added some pearls for the snowflakes. When I place pearls on my cards I always use my paper piercing tool. I just pick them up with the tool and put the pearls where ever I want them on my card. I used the three smalles size pearls for my snowflakes. I hope you liked my card today! This is the first time I'm using this No Peeking stamp set and I can sure see myself using this set over and over again. I also wanted to take a minute to say thank you to you for all your well wishes. My back is starting to feel better, but it still hurts. I'm able to move around and the Advil had been helping. I hope you have a wonderful weekend! Thanks for stopping by! What a sweet Christmas card! 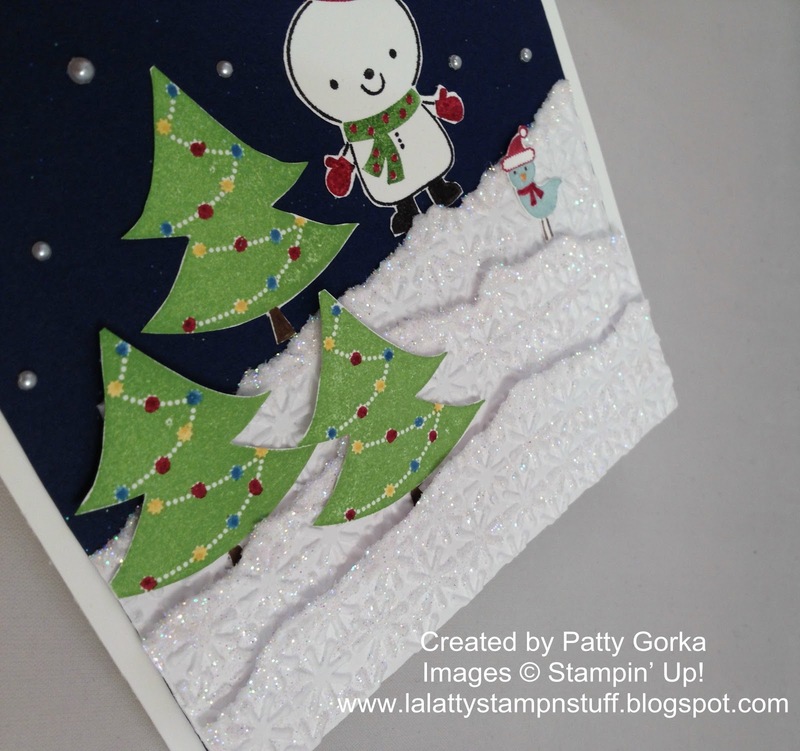 Love how you've created this scene with embossed paper as the snowy ground and lots of pearls. Great idea to emboss the snow! Very cute. This little guy made me smile and I love the pearl snow! Thanks for dropping by my blog too!